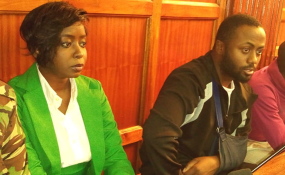 Television journalist Jacque Maribe and her fiancé Joseph Irungu alias 'Jowie' have on Monday pleaded not guilty to murder charge levelled against them over the death of Monica Kimani. The two will spend two more nights in custody after High Court judge Jessy Lesiit ordered the bail mention on Wednesday, October 17 when the duo will be given a date for hearing of their bail application. Mr Irungu, who is the main suspect in the murder case, was arrested on September 24 while his fiancée was nabbed five days later. The businesswoman Ms Kimani was killed on the night of September 19, just hours after arriving in Nairobi from South Sudan. A third suspect in the case, Mr Brian Kassaine, was freed by the court last week but ordered to be reporting regularly to the police.